Below are the pricing books I’ve reviewed on Amazon.co.uk. I very much see pricing as the area where your strategy meets the road. It’s easy to imagine that you’re successful in your differentiation strategy but does it earn a premium price from customers? I aim to be a tough reviewer and my five star books are highly recommended and the four star books are well worth reading. 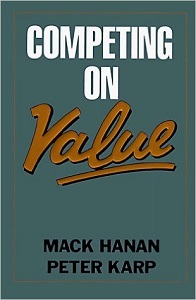 Competing on Value by Mack Hanan and Peter Kemp – Perhaps the first book to look at value pricing for B2B product, this shows how to differentiate by showing your product or service provides more value or faster value. 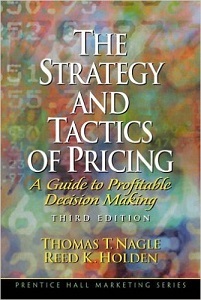 The Strategy and Tactics of Pricing: A Guide to Profitable Decision Making by Thomas Nagle & Reed Holden – a superb look at pricing. It’s where strategy meets the road. This book has been updated since I read it and the latest versions are written by Thomas Nagle and John Hogan. 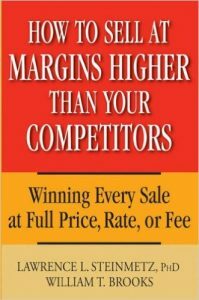 How to Sell at Margins Higher Than Your Competitors: Winning Every Sale at Full Price, Rate, or Fee by How to Sell at Margins Higher Than Your Competitors: Winning Every Sale at Full Price, Rate, or Fee by Lawrence Steinmetz and William Brooks – Packed with great tips and advice on how to withstand pricing pressure from buyers.